I finally got my much needed phone upgrade to the AT&T Tilt2. 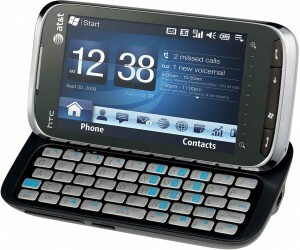 This is a large touchscreen slider phone with a full QWERTY keyboard that runs Windows Mobile 6.5 and HTC’s Touch Flo 3D interface. Previous to this phone I had a Samsung Blackjack running WM6.0 so as you can see this is a considerable upgrade. AT&T was pretty late in getting this phone to market as it was announced back in February 2009 and the first Touch Pro 2’s came to the US market in August with Windows Mobile 6.1 installed. 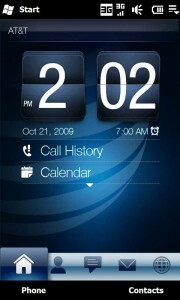 AT&T opted to wait for Windows Mobile 6.5 to be ready and that pushed the date back farther than expected I think. 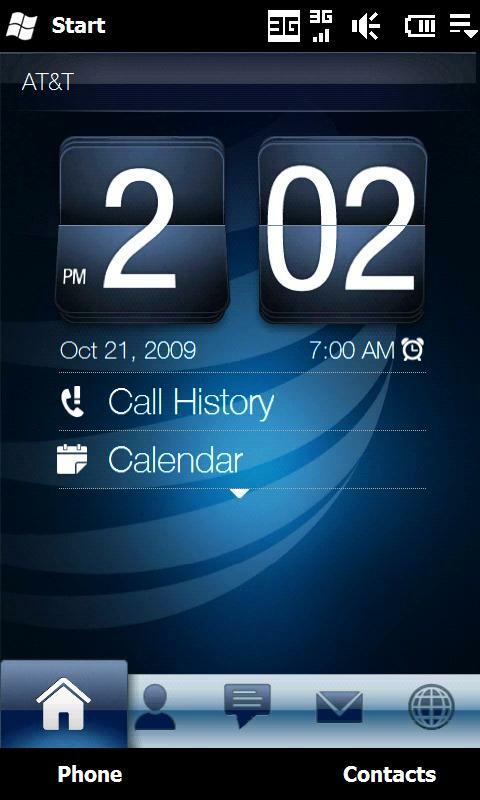 The AT&T Tilt 2 officially launched on October 18, 2009 but was available early though their Premier website. Comparing the two on just basic features the Tilt2 has fantastic call quality and reception compared with my old Blackjack, I have yet to drop a call. The speakerphone is also fantastic as it is very loud with little speaker distortion at full volume, it also has feature of is you place it face down on table it automatically enables the speakerphone. I have found this to be quite handy when I am busy with my hands and still need to answer the phone. In using the speakerphone most people don’t notice they are on it so that is always a plus in my book. To make calls on the phone you must either use the on-screen keypad or the contact list both of which are finger friendly and easy to read. This phone also has ability for conference calling, although I have no need for this I have heard that it is one of the best phones out there for setting one up. You’ll notice straight away that you have HTC’s Touch FLO 3D installed as it gives you several tabs to slide over and allow you to easily get to your Contacts, SMS, Email, Internet, Calendar, Stocks, Pictures, Music, Weather and Settings. I enjoy using Touch Flo 3D as I find that it consolidates what I do most on my phone and makes it easier and quicker to complete that one task. Touch FLO 3D isn’t just a skin, it also has a few applications that substitute for the still clunky versions of SMS, Contacts and Calendar, although if you are used to the WM way the apps are still easily found. SMS and Email work as expected, I am able to setup several email accounts to check no real surprises there. Email still isn’t HTML based so if it isn’t text it just looks garbled. The contact manager also has adds a nice touch by integrating with Facebook and allows you to import pictures and contact information directly to the phone. The contacts also allow you to slide between either contact information, SMS, Emails or phone log about each contact that I find very handy. My few minor complaint, the weather app doesn’t get my local weather only the larger cities around mine, also the clock on the home screen refreshes the time every time I tap the screen which I find quite annoying when trying to close apps with the task manager. Mobile web browsing I would say is a good solid A. I find that the 3G coverage in my area is quite fast providing just a few seconds to get most pages and is able to download a several megabyte file quickly as well. 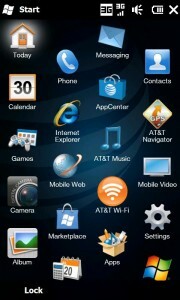 The AT&T Tilt2 comes with an updated Microsoft Internet Explorer and Opera Mobile 9.5. I find that both IE and Opera a pretty fast at rendering pages, however the inability to zoom all the way out on a web page in IE makes me favor Opera a bit more. I have configured my phone to use IE when viewing mobile sites and Opera when trying to get a real web page. In Opera I have noticed that it tries to render pages at about 800px wide which is makes most web viewing very pleasant, it takes just a few seconds to load up my page and even renders the embedded Google Maps with only minor delays. I also installed Skyfire via the new Windows Marketplace to round out my browser attack which works well as expected with my experience on the original Tilt and even my Blackjack. I was surprised to find that Google Maps was not preloaded on the phone as pretty much every phone I have seen that have GPS typically comes with this. I added it and it works as expected. Comparing this GPS speed with the Tilt is like night and day, it takes me about 15 seconds to get a GPS fix with the Tilt2 compared to the original Tilt where it could take a few minutes. This is a much welcomed improvement as I am counting on this more when navigating in big cities. The phone does come loaded with AT&T Telenav which I am not interested in as I am able to read a map. I have also installed an app found over at XDA developers called GPS Enabled Weather Radar. This app does something very simple by getting your GPS location and then getting the radar. It has some great configurable options for animating the map or zooming in on it, and is pretty fast and super handy. One of the first devices to ship with this new mobile platform is the AT&T Tilt2. The largest changes can be found in the by pressing the Start Menu you will see a honeycomb layout of icons for you applications. Other changes in the OS are much smaller such as tabs and finger friendly menu text sizing. If your used to using a Windows Mobile don’t worry you will feel right at home. This has been a longtime missing piece of the puzzle for Windows Mobile users for years, too bad it took so long for Microsoft to realize this. 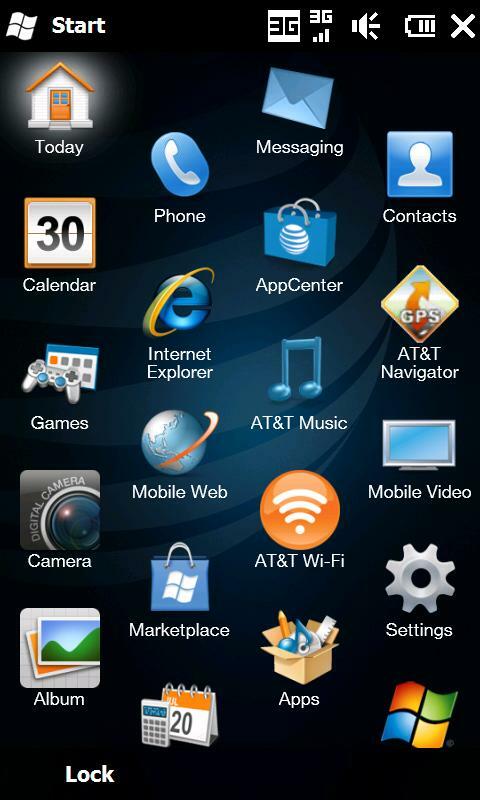 The Marketplace is very good providing users a quick way to download and install applications for your mobile phone. It has a several categories and features that can help people find the correct app or allows you to search for the one you need by name if your in a hurry. There are both free and expensive apps in the store, however I don’t see the expensive ones getting bought all too often, with most of the applications in the iTunes store being 99 cents or so I can see some room for cheaper competition to come in and make a difference. The Marketplace allows you to send it to your AT&T bill or pay with a Credit Card which are nice options to have. My only real complaint is the large text size on the main screen, just not needed for my phone with such a large screen. The Tilt2 is very close to being almost a direct copy of the unlocked European version of the HTC Touch Pro 2 with an extra PTT button on the left hand side, which still doesn’t match the phone in color but is easily re-assignable. The only other difference is the toned down back cover which is a super dark gray and a brushed metal finish in the center of the speakerphone. The keyboard is on the one side of the fence or the other in that you either like it or you hate it, coming from typing on a Tilt and a Blackjack I like it. I think AT&T is right in that you really don’t use the numbers and much as the punctuation because you are typically writing emails and texting which usually don’t have numbers in them. I treat the FN key as I do the shift and find it rather natural. The keyboard also features silver keys with a white back-lighting and a the same brushed metal underneath the keys. I’ve notice that the silver keys are sometimes hard to read during the day but since it is configured like a standard keyboard I hadn’t really noticed this being a problem. The stylus is not magnetic but does activate the device, with WM6.5 and Touch FLO 3D you never really need to use it. The largest problems with the Tilt2 is the lack of a 3.5mm headphone jack, the adapter to it is way too big and clunky to make it truly practical. Battery life has been pretty good I have only managed to kill the phone once by using up the battery. I typically charge it every night and could stretch the battery life to 2 days if I didn’t use the internet and text so much, but where’s the fun in that. This phone has been a real game changer when it comes to communicating with my world. The large screen allows me to view full web pages on demand, with GPS I can navigate the world or get exact weather information as needed, and using the large keyboard I am a text and email machine, plus to top it off it can call people and has a great speakerphone, this is one serious device. This is a welcomed upgrade for anyone who needs to get something done on the go and needs a real keyboard to get the job done.